Venda Pollock: My name is Vee Pollock. I am a lecturer in the Fine Art Department, Newcastle University, working on the historical and critical studies side. Before that, I was a Research Fellow at Glasgow University looking at urban cultural regeneration, and it was there that my research into public art and the urban environment developed. I am interested in the relationship between policy, processes, and artworks – and the amorphous word ‘public’ that we tend to associate with all of these things. Over the past year or so this has taken a focus in the Raploch, a deprived area in Stirling, Central Scotland, which is currently undergoing regeneration led by a Pathfinder Urban Generation Company. The artist, Peter McCaughey, was brought on board by the Urban Regeneration Company, working in collaboration with Gingko projects/Stirling Council, on a Scottish Arts Council funded project to develop a series of creative spaces along a riverwalk, which was basically a very under-used part of urban green space. Peter came in and worked closely with a group of participants who had some connection with the area and also with the wider community. Part of the Urban Regeneration Company’s objective is capacity building and increasing skills and employability for people in the area. 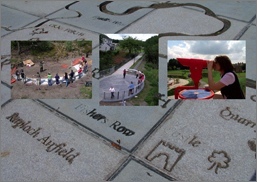 This filtered through to the art process where the participants were taken to metal fabricators, to stone-masons in Aberdeen where they were hammering out stone for elements of the project (referring to images – this is a map and a chess board) and one of the participants has since gone on to become a stone-mason. Part of the aim of my research is to look at how, or whether, public art fits with wider policy objectives and often to look at things from a community perspective and partly to re-assert the voice of the public which is so often missing from these debates. What interests me is that there is a lot of rhetoric about public art – if you read a lots of policy documents, there is lots about what it can achieve; and then there is the reality on the ground. I sit in that space in-between and look both ways. I think that the Working in Public Seminars have made me question our expectations, or the policy expectations, of public art, and the restrictions we place on art and artists in terms of time-frames, budgets, and ‘place’ – how those things come together and whether we can, realistically, realise the expectations that a lot of what policy is demanding from public art and if they are, indeed, the right expectations. I am examining how the experience on the ground can be fed back into policy and, perhaps, invite us to rethink and reconsider some of those questions. A key part of the research is breaking down the language we use as academics, as artists, to talk to the public because a reaction you quite often get is, ‘Well, I suppose it is alright if you know anything about art’ and yet, the people in the place are the most qualified to talk about their experiences and their opinions. So we use innovative methodologies like video and photo diaries. What I did here was follow the process through from the beginning right to the end. In a sense what I have to do is mirror the artist’s capacity for navigation, negotiation, talking – but also to stand outwith the process and see, perhaps, the people who were not included; opportunities that were missed or not developed; and look at the criticism. Through this we built up networks with people from the Urban Regeneration Company (and I am delighted that Judy who is the Enhanced Community Support Officer for the Raploch Project is here) and beyond. Judy and I have interesting conversations that would not have happened otherwise and I think both of our knowledges have been expanded because of that. I have also been able to develop working relationships with landscape architects and people from a wide range of departments in the Council. My practice at the moment is very much aligned with what has gone on during the Working in Public series. It is a reconsideration of the rhetoric/reality relationship from a position, perhaps, in-between. This process is helping me to develop some critical questions and to determine how we can feed the results from research back to the policy-makers to then change practice.